higher ballistic coefficients at the top of the weight spectrum than .277″ bullets. The greater energy and higher ballistic coefficient of heavier .284″ bullets give the .280 Remington a slight ballistic advantage over the .270 Winchester. 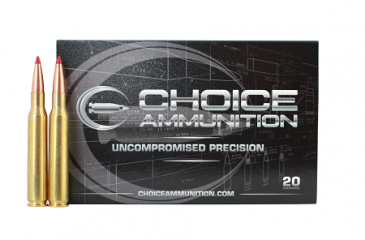 Choice Ammunition has taken our 100% hand-loading techniques and produce an extremely accurate, highly dependable round for the .280 Remington in this load. Our loading tolerances are only matched by passionate hand-loaders in their own loading rooms. Consistent seating depths, powder charges and proprietary formulas of Choice Ammunition, make this 162 grain Hornady ELD-X round the best you can buy on the commercial market today. .280 caliber Remington 140 grain Nosler AccuBond~ The .280 Remington, also known as the 7mm-06 Remington and 7mm Express Remington, was introduced in 1957 for several Remington models. The .280 is based on the .30-06 necked down to accept 7 mm bullets, with the neck moved forward .050 in (1.27mm). The neck was deliberately moved forward to prevent chambering in a .270 Winchester rifle, as firing a .280 round in a .270 rifle could cause the projectile to get stuck in the barrel or rupture the barrel due to excessive pressure. The .280 Remington is capable of generating slightly higher velocities with a given bullet weight than the .270 Winchester, and also able to use heavier bullets due to the larger .284″ diameter. .284″ bullets also have higher ballistic coefficients at the top of the weight spectrum than .277″ bullets. The greater energy and higher ballistic coefficient of heavier .284″ bullets give the .280 Remington a slight ballistic advantage over the .270 Winchester. 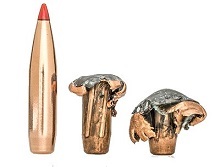 Choice Ammunition has taken our 100% hand-loading techniques and produce an extremely accurate, highly dependable round for the .280 Remington in this load. Our loading tolerances are only matched by passionate hand-loaders in their own loading rooms. Consistent seating depths, powder charges and proprietary formulas of Choice Ammunition, make this 140 grain Nosler AccuBond round the best you can buy on the commercial market today. .280 caliber Remington 160 grain Nosler AccuBond~ The .280 Remington, also known as the 7mm-06 Remington and 7mm Express Remington, was introduced in 1957 for several Remington models. The .280 is based on the .30-06 necked down to accept 7 mm bullets, with the neck moved forward .050 in (1.27mm). The neck was deliberately moved forward to prevent chambering in a .270 Winchester rifle, as firing a .280 round in a .270 rifle could cause the projectile to get stuck in the barrel or rupture the barrel due to excessive pressure. The .280 Remington is capable of generating slightly higher velocities with a given bullet weight than the .270 Winchester, and also able to use heavier bullets due to the larger .284″ diameter. .284″ bullets also have higher ballistic coefficients at the top of the weight spectrum than .277″ bullets. 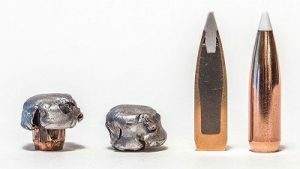 The greater energy and higher ballistic coefficient of heavier .284″ bullets give the .280 Remington a slight ballistic advantage over the .270 Winchester. 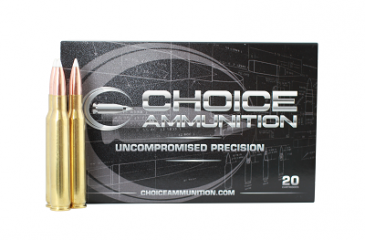 Choice Ammunition has taken our 100% hand-loading techniques and produce an extremely accurate, highly dependable round for the .280 Remington in this load. Our loading tolerances are only matched by passionate hand-loaders in their own loading rooms. Consistent seating depths, powder charges and proprietary formulas of Choice Ammunition, make this 160 grain Nosler AccuBond round the best you can buy on the commercial market today.